The widening of I-44 through Tulsa passed a new milestone last week. Skelly Drive between Riverside Drive and Yale Avenue has remained virtually unchanged since it was built in 1957. In 2005 ODOT released this PDF showing plans of the proposed highway widening west of Yale. The massive, and controversial, undertaking of widening this stretch of interstate began on the west end near Riverside. Homes near Peoria have been moved or demolished. But last week the first recent work on the west side of Yale Avenue was visible as two duplexes were leveled. 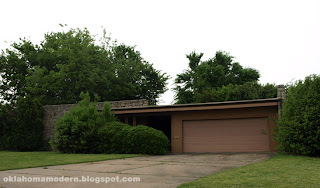 This area along the north side of I-44 is the edge of the Patrick Henry neighborhood, an area known for nice examples of Fifties and Sixties architecture. Most of the dwellings being razed to make way for the highway are duplexes between Pittsburgh and Toledo. 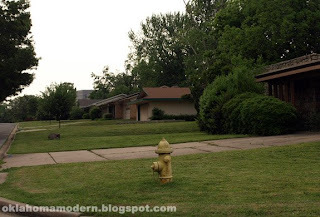 Unfortunately one block of very nice mid-century homes on 49th Place will also be lost. Not to mention the old brick gateway for Patrick Henry IV! Some of these doomed houses are unique, and I thought worth documenting. So I grabbed my camera to snap a few pix before the bulldozers arrived. Here's a view showing the row of homes soon to be torn down, we're looking east along 49th Place from Knoxville. Here's a house I've always admired (and pondered why anyone would molest it with porch lights like that). Jackie calls it the Cake Frosting House because of the mortar squishing out between the bricks. It's quite original, including the gravel roof and skylights over the patio. This is one of the more unusual houses in the area. Its interior patio/entryway is very reminiscent of an Eichler, or what we used to call Patio Homes. We usually refer to it as the Office Building House. There are many other historic Tulsa structures and businesses being moved or demolished to make way for I-44. But widening of of this portion of highway is long overdue. It's just sad to see them go. Ah, sadness. A few houses down from cake frosting house was my grandmothers, I hoped to own the house someday, as its design was so alluring and functional. She passed away shortly after the sale took place... I guess that's how the cookie crumbles.